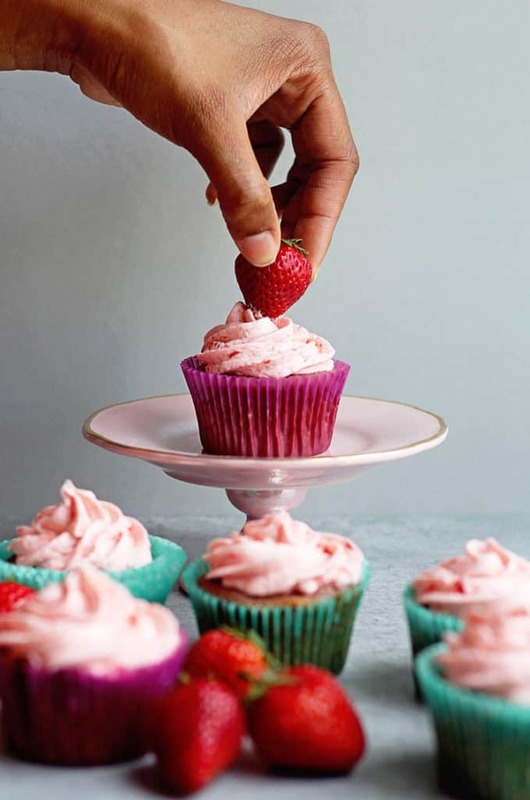 Strawberry Cupcakes Recipe- Forget the strawberry cake recipe made with cake mix! 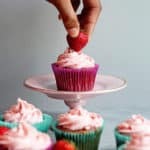 This homemade completely scratch strawberry cupcakes recipe with strawberry buttercream is a classic done right and delicious! I’m a strawberry cake fiend. I love strawberry flavors in a moist and fluffy cake more than anything else. And I love it in strawberry cheesecake form too like this one. One of the cakes my mother and I used to make when I was growing up was a classic strawberry heart cake every Valentine’s Day (I talk about this in my cookbook). It was made from cake mix, and at the time I could care less because it was just so much fun to make! 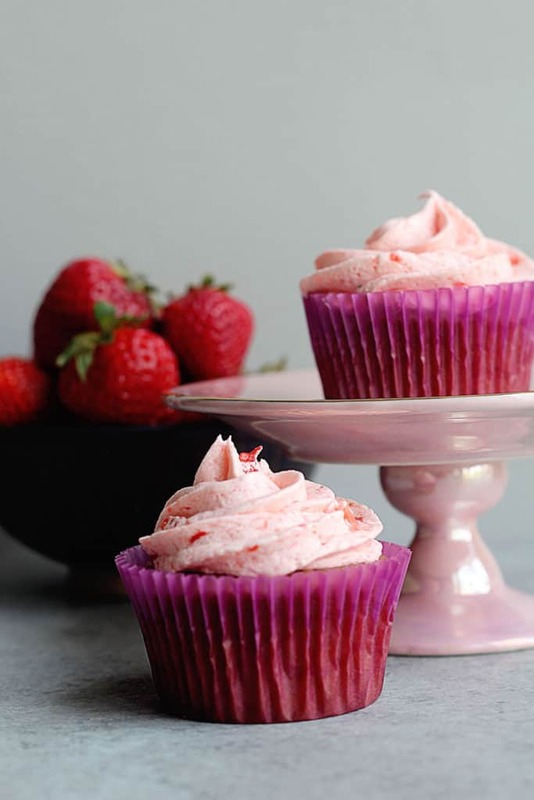 Today, I’m sharing this classic and absolutely sensational Strawberry Cupcakes recipe that reminds me of the days in the kitchen with mama making that homemade strawberry cake. These are a gem because they don’t require a cake mix. That’s right! 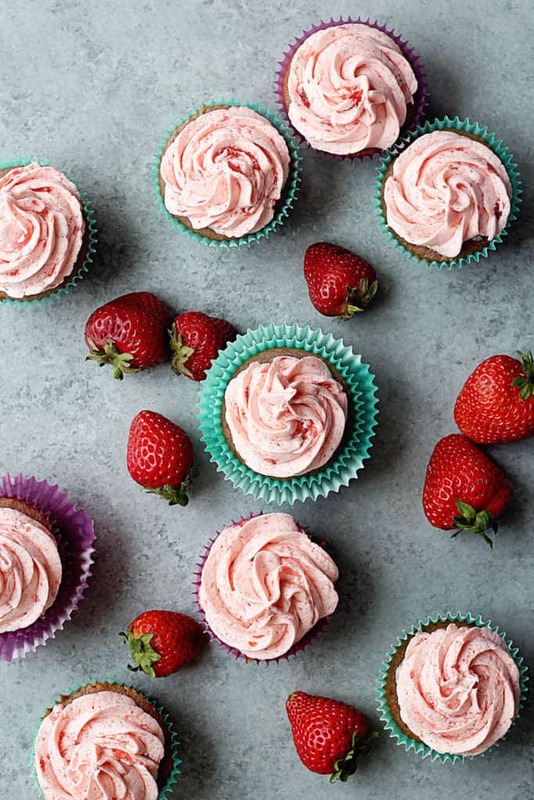 There is no cake mix in sight in this strawberry cupcakes recipe. Everything is scratch. The batter is a typical cake batter which starts with the creaming process of butter and sugar. By adding a strawberry puree to the batter, the cake is filled with the traditional strawberry flavor you would find in a strawberry cake mix but with no artificial flavors. It tastes completely fresh. The texture of the cake is also light and fluffy. The addition of a little bit of oil keeps these cupcakes completely moist and tender too. No one likes a dry cake! The buttercream is my favorite! This classic American buttercream has additional strawberry puree throughout but not too much. I like to make sure the puree is a bit chunkier for the buttercream because I LOVE having those tiny bits of strawberry in each bite. However the end results of the frosting is smooth, rich and creamy from the traditional ingredients: butter and powdered sugar. It makes it even more delightful! 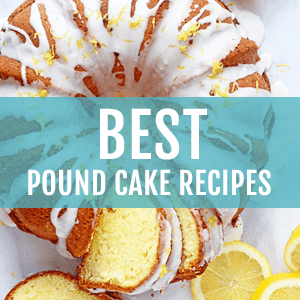 Forget the strawberry cake made with cake mix! 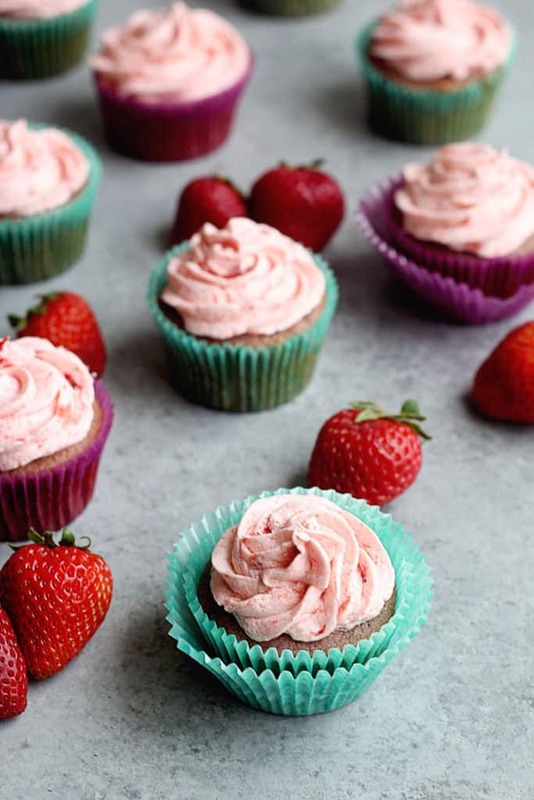 These homemade completely scratch strawberry cupcakes are a classic done right and delicious! Preheat your oven to 350 degrees Fahrenheit. Line two 12-well muffin pans with 20 to 24 cupcake liners. In the bowl of your stand mixer fitted with the whisk attachment, add the granulated sugar and butter and cream together on medium-high speed for about 6 minutes, until very pale yellow and fluffy. Add the eggs 1 at a time to your stand mixer, combining well after each addition and scraping down the sides and bottom of the bowl as needed. Reduce your mixer speed to low and mix in the strawberry puree. In a medium bowl, whisk together the flour, baking powder, baking soda, and salt. Slowly add 1/2 of the flour mixture to your stand mixer. Mix on the lowest speed until combined. In a small bowl, whisk together the sour cream and oil. Add to your stand mixer bowl. Add the vanilla and strawberry extracts and food coloring, if using. Scrape down the sides and bottom of the bowl and mix the batter until just combined. Be careful not to overmix. Using an ice cream scoop (with trigger release) or a spoon, scoop the batter into the cupcake liners until each is 3/4 full. Be careful not to overfill. Bake for 17 to 21 minutes, or until a toothpick inserted into the center of a cupcake comes out mostly clean but still moist. Let the cupcakes cool in the pans for 10 minutes, then transfer to a wire rack. Let cool to room temperature. Lightly cover the cupcakes with foil or plastic wrap so they do not dry out. Clean your stand mixer bowl and whisk attachment. Add the confectioners' sugar and butter and mix on low speed, increasing the speed to medium-high once the sugar is fully incorporated. Continue to mix until light and fluffy. Add the strawberry puree, strawberry extract, and salt and beat until the mixture is cotton-candy pink and the puree is fully incorporated. Once the cupcakes have cooled completely, pipe them with the buttercream (Here, I used a large star tip) and serve. These cupcakes are delicious! Can this recipe be used for a layer cake? I have someone who wants me to make a strawberry grooms cake. It would be a 10 inch with a 6 in on top. Can’t wait to give these a try, they look amazing! 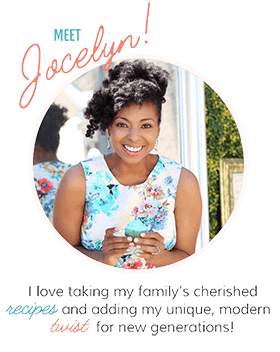 So glad I found your site, absolutely refreshing! Do you measure the strawberries (the 2 cups) whole or do you measure 2 cups of puree? I’m planning on making these tonight for my daughter’s birthday tomorrow, but I can’t tell..do they come out looking pink? Or more of a grayish, if so, do I just add more of the food coloring? This sounds delicious!! Thank you for sharing! If you want them to be more pink, I would definitely add more food coloring since it is more on the natural pink looking side. Let me know how it turns out! Can you make these a day ahead and frost the next day without them drying out? YES! Just make sure you keep them tightly covered with plastic wrap leaving no holes for air. They should be fine that way. Can you substitute avocado oil for vegetable oil? I haven’t tried that so I can’t say for sure that you will have the same effect since they aren’t exactly the same. Definitely try the extract. The oil is much much stronger. Hi! I plan to make this right now but i don’t have sour cream on hand. Is there any alternative to sour cream I could use? Thanks! You could use greek yogurt. Hooray! I’m so glad you enjoyed it. You can share a picture on social media using the hashtag #grandbabycakes! I can’t find strawberry extract. I did, however, find an artificial strawberry flavor from a brand called LorAnn, but I want the cupcakes to be natural with nothing artificial so I’d really like to find a pure extract like you used. Can you tell me what extract you use and where you buy it? I actually have used the LorAnn brand and its great but you can also omit this if you want it to be totally natural. Made these for a church gathering last Saturday. Everyone loved them! I had to make them dairy free, so I used Earth Balance instead of butter, and So Delicious strawberry yogurt instead of sour cream. Even without strawberry flavoring, they had a very fresh delicious strawberry taste! Sounds fantastic! I’m so glad you enjoyed them! Excited to make these! If I can’t get ahold of strawberry extract, should I double the vanilla or just leave it out? Thanks! You can leave it out if you can’t find it. Yep you can leave it out if you need to. Enjoy and let me know how they turn out. Hi!!! I have recently learned that baking is amazing therapy for me. I found your recipe, and decided to try to make them. The flavor is AMAZING! It was a two thumbs up from the hubby! The only issue I am having it that they are dropping when they cool. They dropped alot. What could I do to help that? Not sure if this has been asked already but I wanted to know if this same recipe could be used to make a 2 layered round cake. I love cupcakes but I love the feeling of slicing down a cake! Thanks so much! 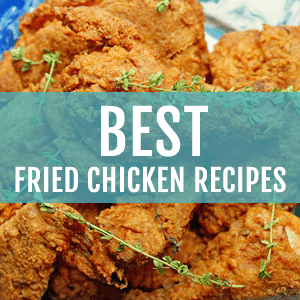 I’m looking forward to using this recipe! Planning on making them tomorrow but they’re actually for day after. Can they be stored for a couple of days after baking? If so, were? Sure they can. I would wrap them super well in plastic wrap and freeze if you don’t want to use them right away. These are so yummy! My daughter choose these for her birthday cupcakes and she was thrilled with how they turned out! Thanks for such a “scrumptious” recipe.